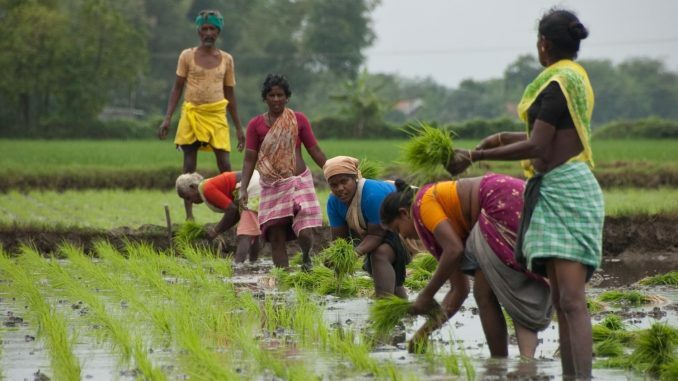 NEW DELHI: The Centre on Sunday said that women participation in agriculture is one-third even while the number in a few southern states is close to 50 per cent. The Central government also stated that 7.5 crore women are engaged in milk production activities in the country. Union Minister for Agriculture and Farmers’ welfare Radha Mohan Singh on Sunday quoted Food and Agriculture Organization (FAO) to say that women’s contribution to Indian agriculture is about 32 percent. “The participation of women agriculture and rural economy in some states such as Hills, Northeast, and Kerala is more than men. Women are involved in 48 per cent agriculture-related employment. At the same time, 7.5 crore women are playing a significant role in milk production and livestock management,” Singh said in the national capital, while addressing a conference on Rashtriya Mahila Kisan Divas. The minister noted that the government has policy provisions like joint leasing for both domestic and agricultural land under “National Policy for Farmers” to strengthen women’s participating in agriculture and allied activities. He added that necessary structural, functional and institutional measures are being promoted to empower women, besides enabling them to build their abilities and increase access to input technology and other agricultural resources and various initiatives. The minister noted that in 2016-17 21 techniques related to women were evaluated and 2.56 lakh women were trained in agriculture-related fields like sewing, manufacturing, value addition, rural handicraft, animal husbandry, beekeeping, poultry, fisheries, etc. “At least 30 per cent of the funds are being earmarked for women under various schemes and programmes and development related activities. The current emphasis in the government is on formation of women self-help groups (SHGs) to connect them with micro-credit through activities like capacity building,” Singh stated.